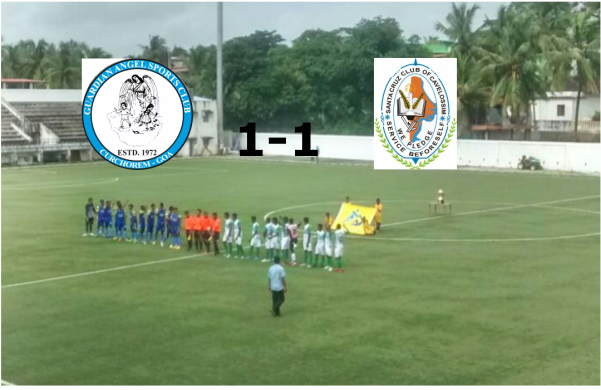 Guardian Angel SC Savordem drew 1-1 with Santa Cruz Club of Cavelossim in the opening match of the Goa Pro League played at Duler Stadium earlier today. Both teams went into the break with a goal each . The match witnessed an end to end affair throughout. 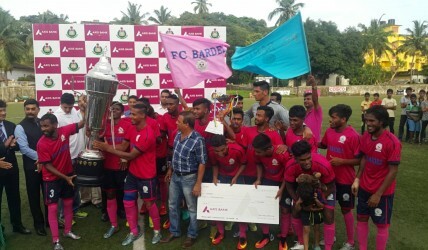 Cavelossim’s Melwin Fernandes scored the opening goal in the 14th minute, but Lavino Fernandes canceled it in the 31st minute to make it 1-1 for GASC. Melwin Fernandes gave Santa Cruz the lead with his perfect header from inside the box after receiving a wonderful cross from Joshuah Vaz . From a goal down, Gardian Angel took control of the game and played some excellent football to make it all square. Skipper Nicholas Rodrigues' header was misjudge by Cavelossim defender Joaquim Carvalho but Lavino Fernandes was in the perfect position to fire the ball into the rival’s net. Five minutes before halftime, Joshuah Vaz was brought down by Guardian Angel defender Sanwil D'Costa inside the box to give away a penalty to Santa Cruz but custodian Ram Sroop stretched to his limits to block Melwin Fernandes' shot from the spot. After the break Cavelossim dominated the game with better ball possession in the opposition half. Again Savordem keeper Ram Sroop came up with a brilliant dive to save Aaren D’Silva’s effort from distance. A minute later D’Silva was unlucky as his header hit the post. Few minutes later Cavelossim’s Cresson Antao's header was pushed for a corner the keeper. At the other end Nicholas Rodrigues' free-kick missed by a whisker, while Anthony Pereira’s low shot was easily collected by Cavelossim keeper Agnelo Gomes. In the 80th minute Cavelossim centre- back Antao was given his marching orders by referee Parmanand Mandrekar for his harsh tackle on substitute Oilex Oliveira on the edge of the box. In the dying minutes of the match both teams tried hard to find the winner but failed to do so. Sao Minguel De Taleigao vs Dempo SC , at 4.00 p.m at Duler Stadium. Report by Khel Now Correspondent Ravish Narvekar from Goa . A true Football enthusiast & a die hard Liverpool fan. Ravish also enjoys travelling & he's an avid foodie.